Quick and tasty recipe to make chocolate snacks. Creamy peanut butter and sticky caramel are irresistible in this recipe. 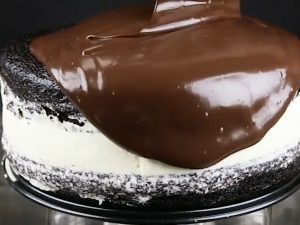 Ingredients: 1 tbsp olive oil; 400 g (14 oz) chocolate; 115 g (4 oz) sugar; 70 g (2.5 oz) honey; 1 egg white; 70 g (2.5 oz) peanut butter; 200 g (7 oz) peanuts; ¾ cup full-fat cream; 2/3 cup dark syrup; 250 g (8.8 oz) sugar; 75 g (2.6 oz) butter. 1)Melt chocolate with olive oil in microwave. Pour half of the chocolate in a parchment covered square pan. Let set completely. 2)Mix sugar, honey and water together. Cook over medium heat until turns amber. 3)Meanwhile beat one egg white until soft peaks. When done, start pouring hot syrup into eggs while still beating with mixer. Beat for 2-3 minutes or until pale and thick. 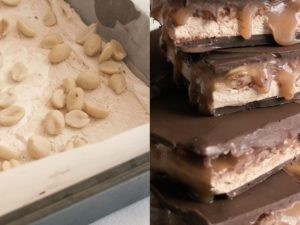 4)Mix peanut butter with nougat and spread over chocolate layer. Top with nuts, pressing them in slightly. Set aside. 5)To make caramel combine syrup and sugar over medium-low heat. Cook until sugar melts and the temperature reaches 150C/300 F.
6)Pour boiled cream into caramel in small batches while stirring with wooden spoon. 7)Set caramel base aside for 5 minutes, then return on the heat for 2-3 minutes and remove onto a working surface again. 8)Whisk in cold butter and set aside for 20 minutes to cool down slightly. 9)Pour caramel over nougat and leave to set. 10)For the final step cover everything with leftover chocolate and let set for the last time. 11)Cut snickers into squires with hot knife and serve. 3 Marshamallow mini recipes: easy and tasty snacks to try!